We conclude our behind-the-scenes tour of the Silverton Branch of D&RGW Railroad in the town of Silverton itself. To this point, we’ve passed through the O scale model railroad towns of Hermosa, Rockwood and Tacoma en route from our starting point in Durango. In our travels, we’ve seen trackside lumber mills, equipment stopovers and order stations, as well as some of the beautiful scenery of the region such as Animas River, High Line and Shalona Lake. Now, to finish our journey along the Silverton Branch, Extra 464 West rolls into station in downtown Silverton, where you’ll discover a variety of compelling features that Doug has built into his O scale recreation of this lumber town located high up in the mountains of Colorado. While the conductor heads into the station to get the return orders for Engine 464, let’s take a closer look at all that makes O scale Silverton jump out of the scene. One of the first things you’ll notice as you take in the community of Silverton is the balloon track that encircles much of the downtown. 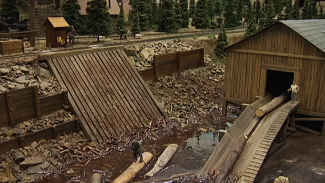 To best utilize space allotted, Doug explains that he had to construct a balloon track to lead trains into and out of O scale Silverton rather than a Y track, which would have been historically accurate for the real town of Silverton but was not an option. Stepping inside the loop, Doug walks you through the kit and scratch-built components of O scale Silverton, including Stratton Feed Mill and Barley & Spencer Lumber Company, both of which were named for Doug’s friends. Aside from these, most of O scale Silverton stands as it appeared in first photos, from its dirt roads to the grassy areas (created using store-bought plush felt) to North Star Mill, which was the largest and also last operational lumber mill in town before the industry moved away. Thus concludes our overview of Doug’s O scale model of the Durango to Silverton stretch of D&RGW Railroad. We’ll get Extra 464 West turned around so we can head downhill and make our way back to Durango and the thicker air that awaits!